Scientists from the University of Colima continue to monitor the Colima volcano. If the eruption worsens, greater measures – such as evacuation of more villages and towns, as well as closure of nearby facilities such as airports – will become necessary. Mexico is a land of volcanoes. Volcanic rocks cover a third of its territory, and 16 volcanoes are considered to be currently active in the country, meaning they have erupted some time in the last 10,000 years. That’s a relatively small figure compared to the total number of volcanoes in Mexico, but significant in terms of the population at risk. Countries with a larger number of volcanoes within their territories include Indonesia, Japan and Chile. And in those places, geodynamic characteristics such as a faster subduction rate – the pace at which tectonic plates are moving – makes the volcanoes prone to erupt more often, with a higher frequency of small eruptions. In the case of countries such as Mexico, where plate convergence is less active, volcanoes have longer repose periods. But once they wake up, Mexican volcanoes may be quite risky. 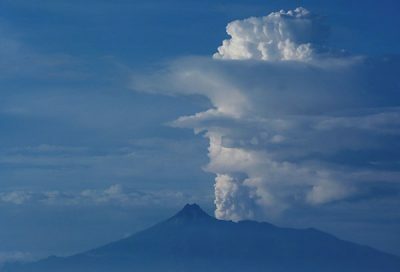 Today in Mexico, only the Popocatépetl and Colima volcanoes – the former located outside Mexico City, one of world’s largest metropolitan areas – are actively erupting. Volcán de Fuego de Colima (Colima Volcano of Fire) as it’s sometimes called, is currently the most active volcano in the country. Over the last 500 years, it’s had frequent minor eruptive activity, with more than 30 explosive eruptions, the most prominent occurring in 1585, 1606, 1622, 1690, 1818, 1869, 1890, 1903 and 1913. In 1991, a lava dome grew and collapsed, producing several glowing molten avalanches (what geologists call pyroclastic flows). In 1998, effusive activity led to strong explosive activity with nine-kilometer-high eruptive columns, ash falls that landed almost 30 kilometers from the vent, and large pyroclastic flows in a 15-kilometer radius. Then, in July 2015 Colima again began showing signs of eruptive activity, with production of lava domes and flows that spilled over the flank of the mountain and produced all sizes of rock fall from the lava front – perhaps its strongest activity since 1913. This latest eruptive phase has not ended, meaning the situation with Colima today resembles the pattern of previous large eruptions in 1818 and 1913. In recent years, the population that lives near the Colima volcano has grown exponentially due to the economic growth in Colima and Jalisco states. In its vicinity, there are at least 28 villages and cities crossing both states. The most prominent cities are Quesería, Ciudad Guzmán, Tuxpan, Villa de Alvarez, Comala, Cuauhtémoc and the city of Colima itself, the capital of the state. If Colima’s eruption worsens, it could impact some 700,000 people. In addition to the possible effects of eruptive activity on local life, Colima’s volcanic activity stands to have a significant impact on Mexico’s travel infrastructure. A major highway connecting the cities of Guadalajara and Colima runs close to the volcano’s base, and both the Colima and Manzanillo airports are also nearby. Colima’s activity is monitored by the volcano observatory at the University of Colima. Using seismic stations deployed around the volcano (Red Sismológica de Colima, or RESCO), scientists employ seismological, geodetic, geochemical and visual monitoring to try to understand and predict what’s happening inside the volcano. In particular, the absolute and cumulative real-time seismic amplitude – a technique for characterizing a volcano’s changing seismicity as it is occurring – are continuously followed. Geodetic monitoring, sometimes called volcanic deformation, uses dry inclinometers installed at the volcano and periodic measurement of geodetic benchmarks using an electronic distance-meter to predict future eruptive behavior. Because gases are responsible for volcanoes’ explosive events, figuring out what comes next for Colima, or any volcano, requires measuring the concentration of those gases to diagnose what processes are occurring deep inside it. With geochemical monitoring, scientists sample nearby spring waters and fumaroles (openings in the earth’s surface where gases emerge) when conditions allow, to work out chemical composition, measure carbon dioxide and determine the sulphur dioxide (SO₂) emission rate. Thanks to Colima’s recent activity, volcanologists from the National Autonomous University have now joined their University of Colima colleagues to measure Colima’s SO₂ emission, providing remote sensing techniques such as a dedicated outdoor air system (DOAS) and a UV camera. With this recent eruption, Colima has joined the ranks of the better-known Popocatépetl volcano, which has been erupting intermittently since December 21, 1994. There, the initial activity was an explosion to clear the volcano’s conduit system, which continued into 1995, though without spurting out any new magmatic material. After a quiet period between August 1995 and March 1996, Popo started to explosively erupt again in early March 1996 and, later that month, the first lava domes were observed inside the immense crater of the volcano. At the time, the crater was almost kilometer in diameter and almost 200 to 400 meters deep. Since 1996, Popo has continued to experience explosive events that have wiped away the lava domes formed inside the crater. Thus far, some 60 lava domes have been formed and then destroyed by explosive eruptions. This is part of an active volcano’s normal construction-destruction process. Still, some of this explosive activity has been so energetic that civil defence authorities have evacuated communities closest to the crater, including Santiago Xalitzintla and San Pedro Nexapa, both of which are located approximately 11 kilometers away. The danger radius for Popo is generally considered to be eight kilometers, so these evacuations have been cautionary, as they were with the Colima eruption. Still, Popo has done some damage: in 1997 the Mexico City airport, which is Latin America’s second-busiest and today serves some 38 million passengers a year, was closed for hours because ashes from the volcano reached the facilities. In 2013, the airport in nearby Puebla city was also closed due to Popo’s ash falls. Hugo Delgado Granados is a researcher in the Department of Volcanology at the National Autonomous University of Mexico (UNAM). This article was originally published on The Conversation.